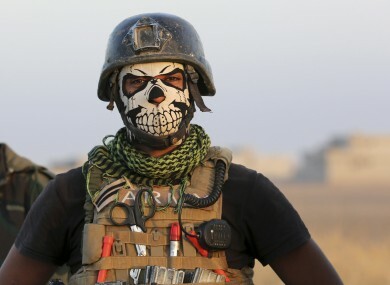 member of Iraq's elite counterterrorism forces stands as they advance towards the city of Mosul, Iraq, last October. THE ESTIMATED 750,000 people living in jihadist-controlled west Mosul are in grave danger, the United Nations has warned, 100 days into a massive Iraqi operation to retake the city. “We are relieved that so many people in the eastern sections of Mosul have been able to stay in their homes,” the UN’s humanitarian coordinator for Iraq Lise Grande said in a statement. “We hope that everything is done to protect the hundreds of thousands of people who are across the river in the west. We know that they are at extreme risk and we fear for their lives,” she said. On 17 October, tens of thousands of Iraqi forces launched an offensive – Iraq’s largest military operation in years – to retake the country’s second city from the Islamic State group. The going has been tough for federal forces as IS has defended its last remaining major stronghold in Iraq fiercely. All central neighbourhoods on the east bank of the Tigris River that divides the city have now been retaken and commanders are devising a strategy to tackle the western side of the city. The slightly smaller western side is even more densely populated than the east and is home to some of the jihadists’ traditional bastions. All bridges over the Tigris in Mosul are unusable and the narrow streets of the Old City will make any military offensive into west Mosul a perilous operation both for Iraqi forces and civilians. In most other urban battles Iraq has waged against IS since the jihadists took over a third of the country in 2014, cities had been almost emptied of their population by the time federal forces moved in. But in Mosul, while around 180,000 people were displaced since the start of the operation, 550,000 residents of east Mosul also stayed in their homes. Email “Warning of 'extreme risk' to citizens as the battle for Mosul rages on”. Feedback on “Warning of 'extreme risk' to citizens as the battle for Mosul rages on”.